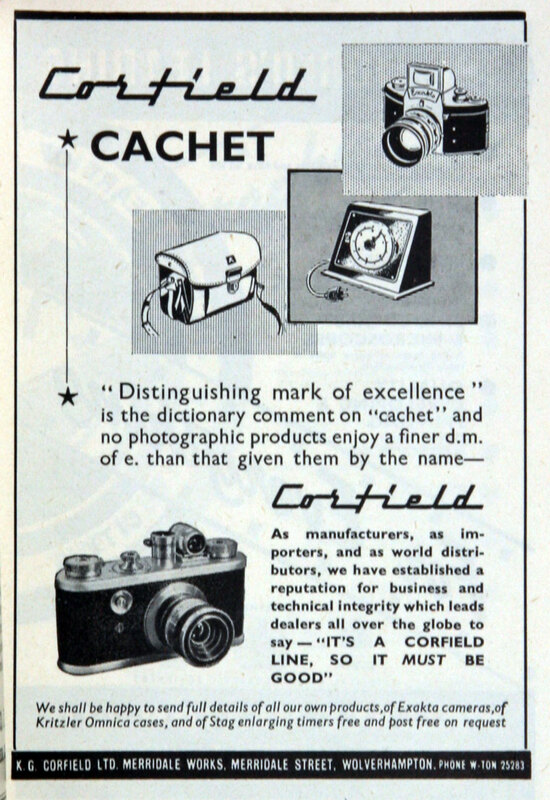 1947 Kenneth Corfield (later Sir Kenneth) read an article in 'Miniature Camera Magazine', which described the construction of an accurate enlarger exposure meter. At the time he worked for Fischer Bearings Co. He built an experimental version of the meter at home and demonstrated it to Walsall Photographic Society. 1948 The first commercial versions of the Lumimeter were completed at home and sold. In response to the flow of orders, took small workshop in the old Merridale Works in Merridale Street (ex Henry Loveridge and Co). 1948 Formed limited company, with John Corfield as technical director. Further products were developed Corfield Telemeter Rangefinder and Corfield Optical Exposure Meter. 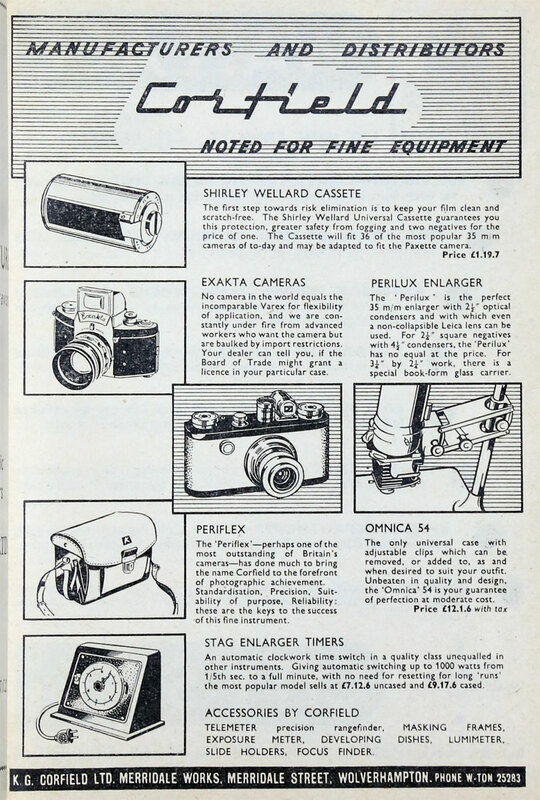 1950s Further dark room products developed and a projector; became agents for a range of European photographic products. 1952 Developed a 35mm camera, aiming to make use of second hand Leica lenses; British lens manufacturers could not supply a lens but Corfield made contact with British Optical Lens Co of Walsall to develop a lens which would be mounted in an assembly by Corfield; the camera was called Periflex. The company expanded into a neighbouring unit at Merridale. Over the following years, various improvements and accessories were developed for the Periflex. 1959 The Merridale factory was condemned so the company moved to Ballymoney in County Antrim where a new factory was put up for them. 1960s The company's final 35mm camera was the Maxim, a cheaper camera. In order to compete against the increasing number of cheap Japanese imports, the Corfield 66 was designed which used 120 roll film. Capital investment came from Guinness, to enable Corfields to develop a new camera model. Kenneth Corfield was initially Managing Director, reporting to a new board; he left soon afterwards (going on to an illustrious career at STC where he was knighted). Corfields also had to produce components for the metal beer kegs. Not finding enough money for investment in cameras, the new MD John Corfield negotiated a licence to manufacture and market the Prestolite range of alternators and voltage regulators for motor vehicles. 1971 K. G. Corfield Limited finally closed in July 1971. This page was last edited on 14 December 2014, at 12:12.